Whether you have just picked up the bass or you’re trying to improve your technique, this book provides a strong foundation of all the bass basics. Learn how to create bass lines instead of simply copying them and practice your skills with the songs and exercises included on the CD. 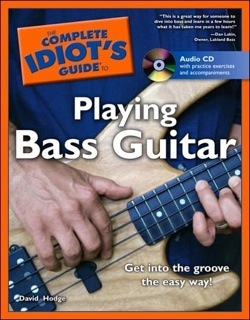 Order The Complete Idiot’s Guide to Playing Bass Guitar from Amazon.com today. Every musician knows that the bass guitar provides the underlying heart and soul of a band. The Complete Idiot’s Guide to Playing Bass Guitar provides a complete instruction program for beginners and helps walk even experienced guitarists through the most confusing concepts. The book covers the basics of the bass clef; how to play chords and arpeggios; advanced techniques like dead notes, slapping, and popping; locking with your drummer; and techniques for developing speed and agility. Hodge writes in an easy-to-understand, down-to-earth manner, and it’s almost like having an experienced teacher there with you. Mr. Hodge anticipates questions very well, and his conversational writing style translates superbly to learning an instrument. Check out the Guitar Noise review of this book. Get an idea what this book is like by checking out David’s free Guitar Noise lesson on how to play “Money” by Pink Floyd.